This story was co-published with Ensia, a solutions-focused nonprofit media outlet reporting on our changing planet. Yet in the current political climate and administration, where an “energy dominance” mandate for management has been passed to federal public lands managers, we are facing a future where one of the West’s most iconic species — the mule deer — could be irreparably devastated. The stakes are obvious for Wyoming, but even for those who aren’t concerned about Wyoming ecosystems or the native big game species of the West, this is a conflict with sobering nationwide ramifications. What we’re faced with today is a federal government determined to continue free-for-all industrial development against the will of its citizens, even when we offer pragmatic, evidence-based conservative solutions that require absolutely no sacrifice. 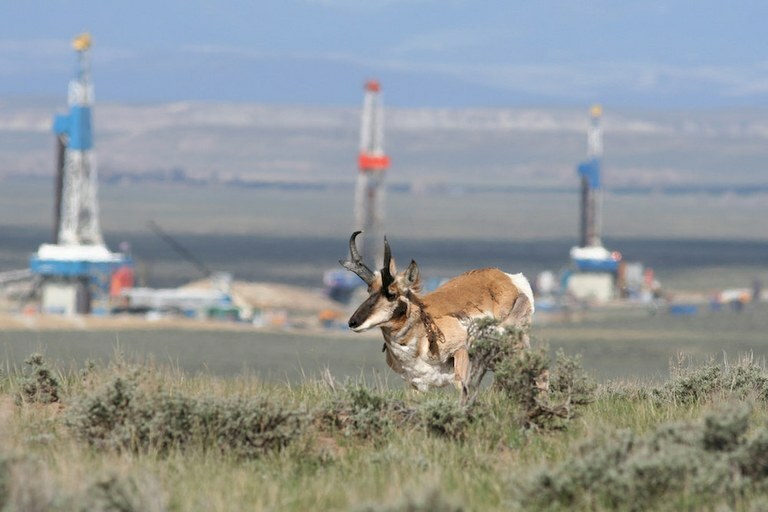 A pronghorn runs in Wyoming's Pinedale Anticline natural gas field. Mule deer (Odocoileus hemionus) are indigenous to the West, and the youngest branch of the deer family in North America. “Muleys” get their name from their large ears. They are elusive, highly specialized, beloved animals, and hunting them can take you deep into some rough and beautiful country. In a state that brings in about $300 million annually in total big game hunting revenue, deer represent a major contribution to local economies and conservation funding. Our knowledge about mule deer and their particular migratory behaviors has deepened as research technologies and field ecology methods have become increasingly sophisticated. Wyoming, with its lengthy, brutal winters and dry summers, is a difficult place for a large mammal to make a living. Most big game survive the climate extremes by moving seasonally across landscapes as forage conditions change through the year. 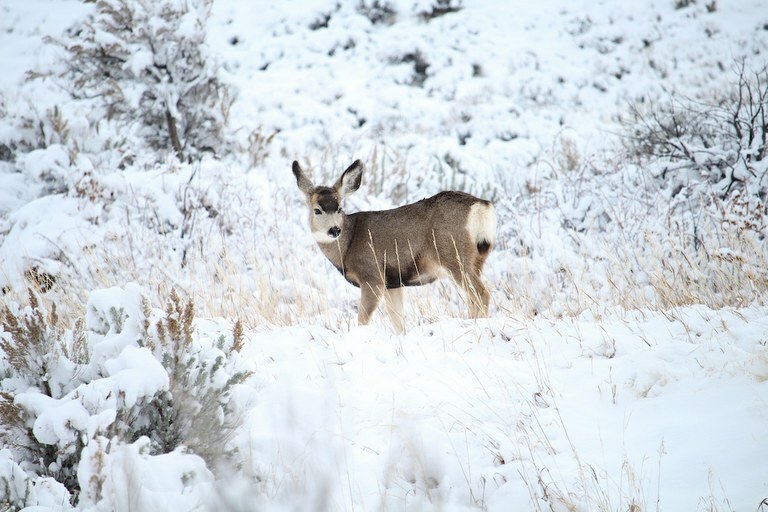 Most famously, the thousands of mule deer in Wyoming’s Sublette Herd travel 150 miles twice each year, moving northwest from lower elevation winter range in the Red Desert to the lush, green summer slopes of the Hoback Basin just south of the Tetons, and then reversing course to return to the desert in the fall. It’s a jaw-dropping navigational feat, considering that the deer begin their travel to higher summer range at the end of a long winter, when they’re in their worst shape of the year. Some areas of the migration corridor are as narrow as half a football field. It’s something of a wonder that the corridor (the longest mule deer migration ever recorded, and the second-longest overland migration of any kind recorded in North America) has remained functional for this long at all. Unfortunately, we are uncovering the scope of these incredible feats at a time when a new federal policy toward on our public lands favors energy extraction over natural resources. In 2018, federal oil and gas lease sales grew exponentially in Wyoming. Nearly 1.5 million acres (600,000 hectares) of public land in Wyoming was offered for lease to oil and gas companies by the Bureau of Land Management (BLM), the federal agency that manages more than half of the public lands within the state. Only a small percentage of these acres fall in critical habitat for mule deer, some even smack dab in the middle of the Red Desert to Hoback route. These parcels represent a fraction of the massive acreage on offer to oil and gas companies — for example, less than 9 percent of the acreage included in the upcoming February sale. But development within them has the potential to functionally fracture this ancient migration and devastate these herds. A mule deer pauses near South Fork Shoshone River in Wyoming. Does Science Matter In Decision-Making? Protecting the Red Desert to Hoback and other well-documented big game migration corridors in Wyoming is not a threat to Wyoming’s energy industry, where millions of acres are already open for drilling. But this conflict is much greater than the question of whether energy should outweigh wildlife when it comes to management of multiple-use public lands — it shouldn’t, and legally it does not. It’s also a question of whether or not science matters in decision-making. The best peer-reviewed research in the world regarding these migrations is taking place in Wyoming, and it shows that oil and gas development within migration corridors and winter range is a direct threat to mule deer in particular. Muleys don’t ever get used to the presence of oil and gas activities, even over the course of generations. And unlike other big game, they can’t adapt their migratory strategy or route as the landscape changes around them. They learn their migration route — scientists hypothesize that they are taught by their mothers — and keep to it for the rest of their lives. These unique traits are compelling, but maladaptive in the context of an increasingly disturbed landscape. We know what we must do to ensure our deer populations remain viable. It’s as simple as this: Of all the tens of millions of acres of public lands within Wyoming, we must avoid drilling within the small percentage these herds rely on. The Wyoming Outdoor Council, alongside several other conservation NGOs, has repeatedly made this case to federal and state decision-makers. Yet the BLM continues to open up hundreds of thousands more acres for development each quarter. Worse, these leases are selling for dirt cheap — at the minimum allowable auction price of $2 per acre, and sometimes even less. The state brought in only about $50,000 from parcels in the middle of the Red Desert to Hoback corridor, a lifeline for some 5,000 deer. The BLM jeopardized the integrity of the world’s longest mule deer migration corridor for $10 per deer. That’s both unacceptable and unnecessary. It can be hard to imagine perilously grave declines in a species with such deep and enduring cultural value. But federal oil and gas leasing for the sake of a misguided “energy dominance” mandate is proceeding at such an alarming pace that another oil and gas firesale year like 2018 will set us on a course to forever decimate Wyoming’s deer. That’s why we’ve started a petition that allows people to add their names in opposition to these decisions that prioritize a rush to energy extraction at the expense of our natural resources. Wyoming is an energy state, but we’re also a wildlife state, home to landscapes and species that have sparked human imaginations and passions for countless generations. If we lose our deer herds for the sake of quick oil and gas profits, the loss won’t just be felt in our deer, but in ourselves as well. We know the science, and we know what it says we must do. And we are not willing to forever give up a special and wild part of who we are.